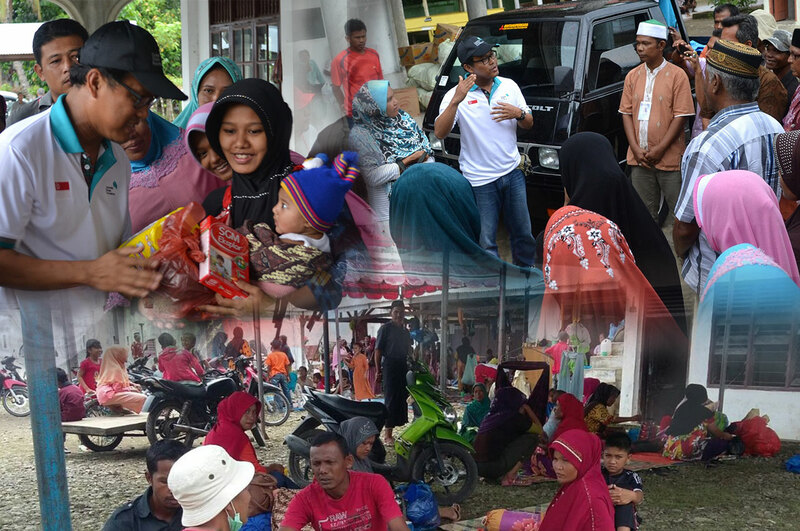 Singapore, 10th December 2016 – Relief supplies such as food, drinking water, tents and blankets have been distributed quickly to quake survivors at various evacuation camps across Pidie Jaya over the last few days. Corporate Citizen Foundation (CCF) has been working swiftly alongside local government agencies and non-government organisations (NGO) in their efforts to meet immediate ground needs. Other critical aid included provision of medical supplies to support the few district’s hospitals with overwhelming concentration of patients. 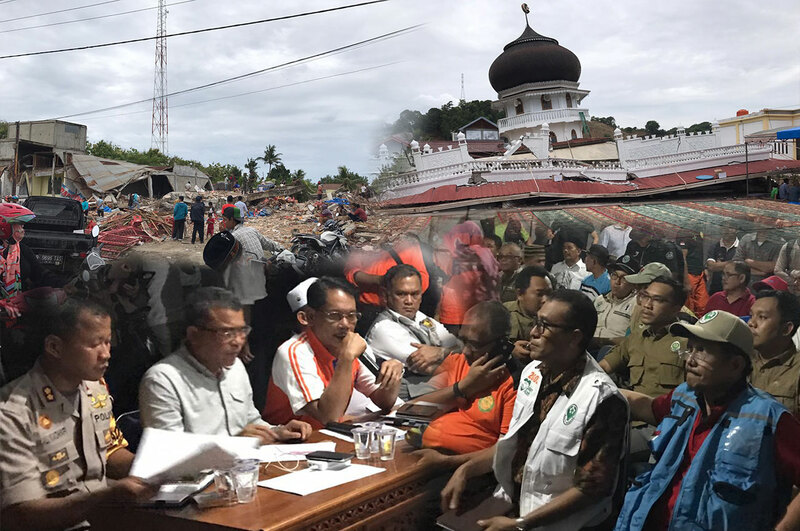 Over 45,000 villagers have been displaced and living in temporary evacuation centres erected by the local government agencies or at designated community facilities. Current official count stands at a total of 101 lives lost and 850 people reported to have sustained minor to serious injuries. Almost 3,000 houses had been badly damaged while another 9,000 others had light damages. 300 aftershocks had been felt since the earthquake first shook the area on 7th December. As such, many people are still afraid to return to their homes in fear of worse aftermath indicated by the frequent aftershocks. CCF’s 2-man team is in close liaison with the local government to assess scope of aid required, in particular with the Pidie Jaya’s Health Cluster Coordination Team. Its Head Coordinator had earlier highlighted serious concerns over the living condition in the evacuation centres due to the lack of attention on hygiene and sanitation issues. In its commitment to provide sound ground information, CCF had raised such important findings from their assessment to partners including the AHA Centre and SEED partner ChannelNews Asia. Together with local NGO partners Yayasan PASKA Aceh (PASKA Aceh Foundation) and Yayasan Pusaka Indonesia (Pusaka Indonesia Foundation), the team has identified two community-led evacuation centres which have been set up informally by the villagers. The villagers living there mostly have partially destroyed homes within 3km from the evacuation centre or have abandoned their homes that are situated too near the sea. As more aftershocks continue and the fear of potential tsunami still persisting, these villagers had set up an evacuation centre and community kitchen near a mosque. 1,800 hygiene kits were procured with each containing towel, soap, toothbrush, toothpaste, shampoo, detergent, mosquito repellent, female sanitary napkins and baby diapers. In addition, necessary food supplies catering to children and the elderly such as baby milk powder, green bean, sugar and biscuits were also distributed to the community kitchen at these evacuation centres. CCF will continue to monitor and liaise with our local NGO partners for further development in Aceh. Singapore, 8th December 2016 – Singapore’s Corporate Citizen Foundation (CCF) is on the ground at Pidie Jaya, Aceh to carry out emergency response and needs evaluation in the aftermath of the earthquake yesterday. A 2-man CCF team has been in touch with regional partner, ASEAN Coordinating Centre for Humanitarian Assistance (AHA Centre) to support the coordination of response. Together with SEED partner ChannelNews Asia, the team aims to disseminate critical information from the affected communities. 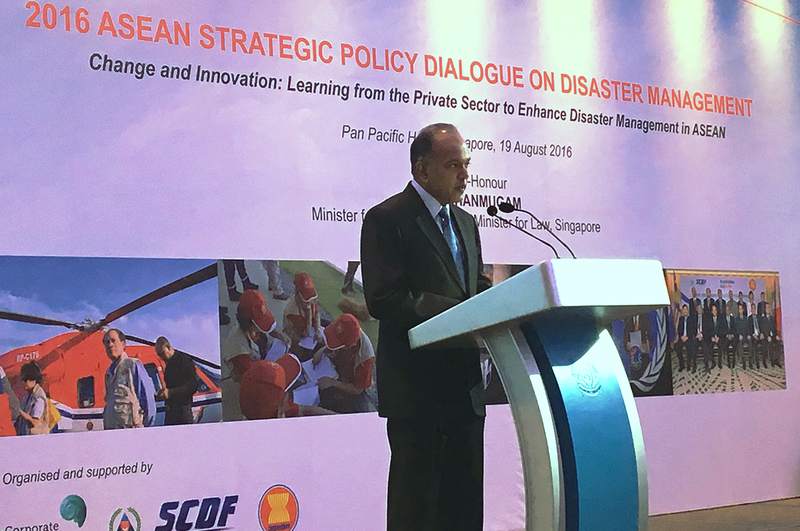 Singapore, 19 August 2016 – In conjunction with this year’s World Humanitarian Day, Corporate Citizen Foundation (CCF) co-organised the second ASEAN Strategic Policy Dialogue on Disaster Management with Singapore Civil Defence Force (SCDF), ASEAN Secretariat and ASEAN Coordinating Centre for Humanitarian Assistance (AHA Centre). Representatives from Singapore’s Inter Religious Organisation (IRO), the Corporate Citizen Foundation (CCF), corporate partners and the young children of the newly-reconstructed COU-IRO Home. 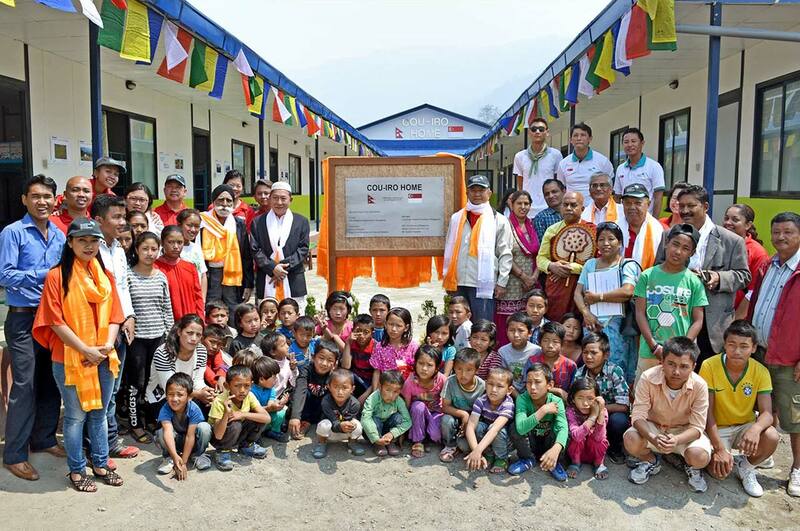 Tuesday, 26 April, Sangla Tokha – A year and a day after the massive earthquake hit Nepal, and while many await their new homes, more than fifty orphans have gotten a new and safe place to live in at the Sangla Tokha district. 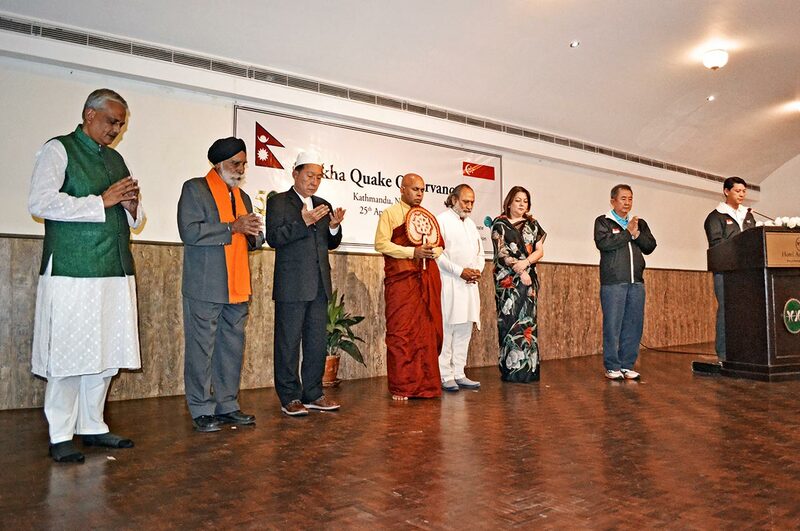 (above) A one-minute silent prayer in commemoration of those who have perished from the destructive Gorkha earthquake led by inter-faith leaders, along with Hotel Annapurna’s Executive Director Mrs Shreejana Rana and CCF’s Chairman Lim Choo Leng. Monday, 25 April, Kathmandu – Singapore’s Corporate Citizen Foundation (CCF) and local hospitality giant, Hotel Annapurna, once again joined hands, but this time to hold an observance ceremony to remember those who perished and survivors who lost their loved ones and homes in the massive Gorkha earthquake of 2015. 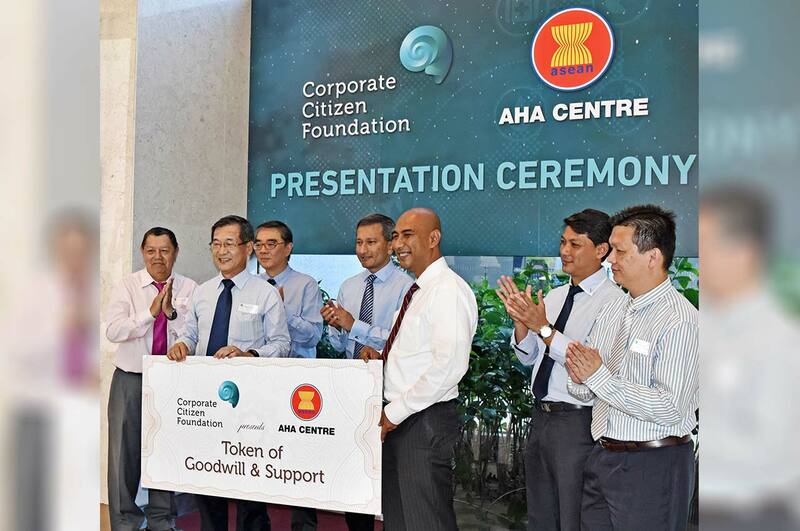 (above) The Corporate Citizen Foundation (CCF) presenting its Token of Goodwill & Support to the ASEAN Coordinating Centre for Humanitarian Assistance on disaster management (AHA Centre), with CCF Board’s Executive Director, Wong Chin Sing and AHA Centre’s Executive Director, Said Faisal. The momentous occasion was witnessed by (from left) CCF Board’s Executive Director, Teng Soo Hai, RSIS’s Executive Deputy Chairman, Ong Keng Yong, Minister for Foreign Affairs, Dr Vivian Balakrishnan, CCF Executive Director, Hassan Ahmad, & SCDF’s International Relations Director, Lee Yam Ming. Friday, 11 March 2016 – Building on the landmark working agreement signed last November between Corporate Citizen Foundation (CCF) and AHA Centre, the Singaporean corporate humanitarian outfit presented a SGD100,000 support towards AHA Centre’s operations and stockpiling efforts, to better respond to regional disasters. Incidentally, this made CCF the first organisation from the private and people sectors to have contributed towards AHA Centre or the ASEAN Coordinating Centre for Humanitarian Assistance on Disaster Management. Pulau Ubin, 31 January — Visitors can now visit Pulau Ubin with greater peace of mind. 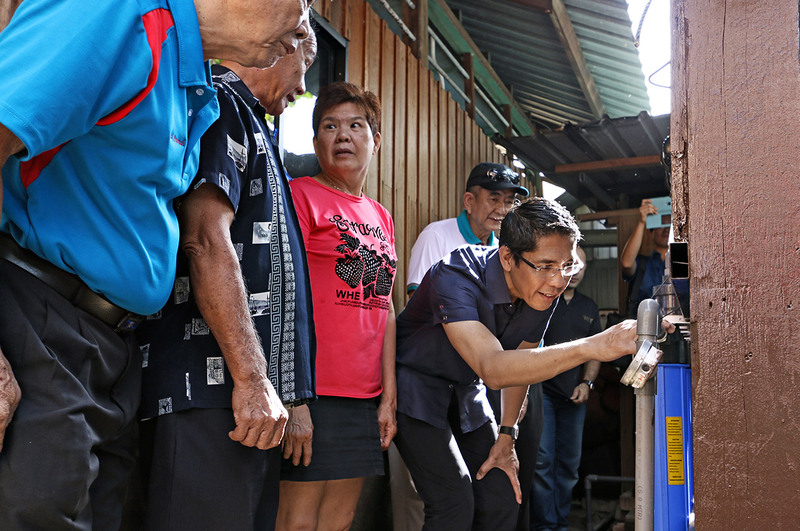 With the installation of new water treatment systems, the food establishments at Pulau Ubin have resumed preparing and serving food using safe water directly from their taps at their outlets. This comes just a month after a joint statement by four governmental agencies on the deteriorating water quality on Pulau Ubin was issued. Corporate humanitarian NGO, Corporate Citizen Foundation (CCF) had worked closely with the Siglap Constituency Consultative Committee (SCCC) to address the critical water issue on the island, through the installation of water treatment systems. 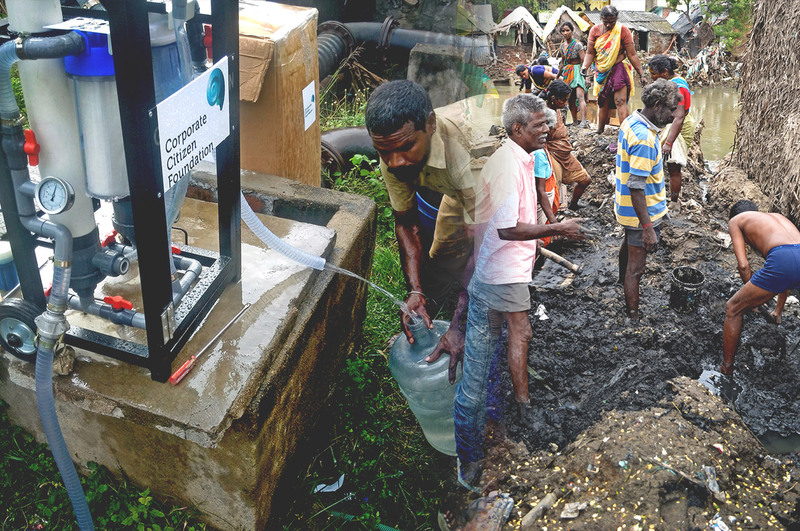 Wednesday, 9 December, Chennai – Singapore’s Corporate Citizen Foundation (CCF) today installed water filtration systems for the floods-stricken community of Kannagi Nagar resettlement colony. 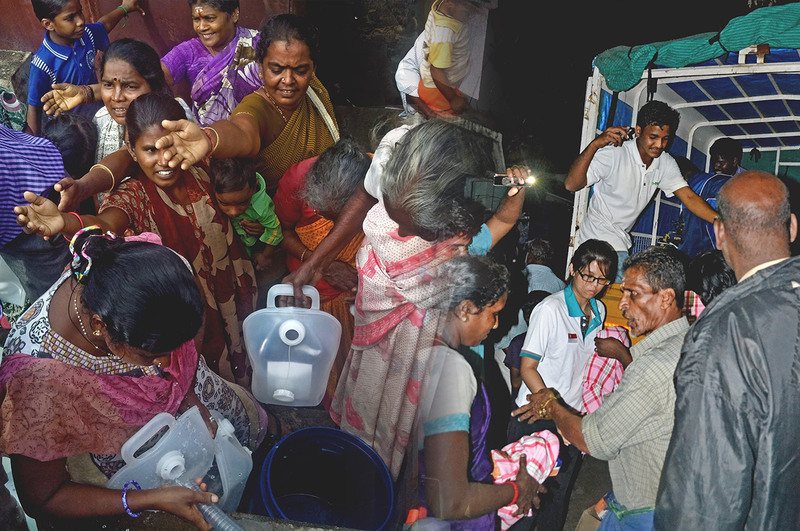 Jerry cans were provided to the community for collection and storage of the cleaned water.‎ The efforts came amidst anxieties that water sources were contaminated by waste waters from the overflows of drains and sewers due to the massive floods. 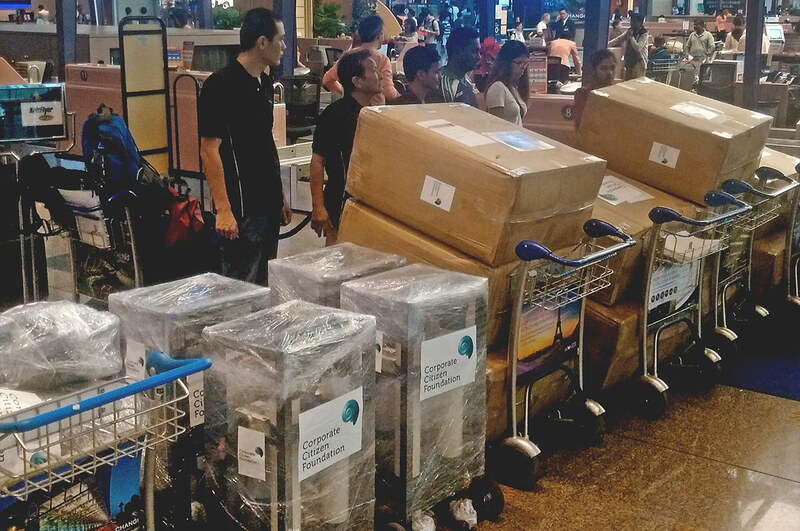 Tuesday, 8 December – A 3-man team from Singapore’s Corporate Citizen Foundation (CCF) departed for Chennai to support the floods relief efforts there.